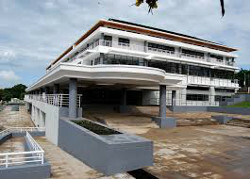 The Malawi College of Medicine (COM), a constituent college of the University of Malawi which is a member institution of the Malawi Research and Education Network (MAREN), has been hailed as one of the institutions making significant contribution towards Malawi’s healthcare research system which has been described as ‘the best” in Africa. United Kingdom’s Department for International Development (DfID) delegation which toured the country in August 2015 said Malawi’s healthcare researchers “are the best in Africa” judging from the success which the continent’s healthcare system has achieved using research done by the country’s healthcare institutions. During the tour, the delegation, which was led by Chief Scientific Adviser Professor Chris Whitty, visited some of the country’s key healthcare institutions including the Malawi College of Medicine, the Malawi Liverpool Trust, the Malaria Project, John Hopkins and the Malaria Alert Centre in Blantyre before holding an interface with the media where Whitty expressed his delight at the institutions’ achievements. Professor Whitty said DfID is impressed with the strides Malawi is making in reducing cases of malaria, HIV/AIDS, and pneumonia in children and the overall contribution it is making towards the healthcare system in Africa. “Malawi is the best because research that is done here is very strong and is used not only in Malawi but the whole of Africa. It is also important to remember that child deaths and deaths from HIV have fallen very fast in the last 15 years and that is among other things, based on excellent research done in Malawi,” said Whitty. In response, the College of Medicine hailed DfID for sustained funding towards healthcare research projects in the country. Since 2012, the DfID has been funding six research projects at Malawi Liverpool Trust to the tune of 1.2 Million Pounds.